The Blue Jays officially signed Frank Thomas as I told you yesterday only the deal was two-years $18 million rather than the $23 million I posted yesterday. There is also an option year for $10 million. Thomas give the Blue Jays the big bat they really need in the middle of their lineup. If he can stay relatively healthy he should make a dramatic difference for them. The Oakland Athletics promoted bench coach Bob Geren to manager. Geren is supposedly one of general manager Billy Beane's best buds. I would not expect any radical departures from the Oakland system with Geren at the comm. While I'm on Oakland the Athletics may actually benefit from losing Frank Thomas as it gives Dan Johnson a chance to play. Johnson did not have a great season in the majors but he should still develop into a .290-.300/ 30 homeruns type hitter. He may be forgotten in mixed leagues and in AL-only he isn't too likely to be expensive even if he isn't quite in the sleeper category yet. The Chicago Cubs agreed to a trade with the crosstown Chicago White Sox. The Cubs send right-hander David Aardsma and lefty Carlos Vasquez to the White Sox for lefty Neal Cotts. David Aardsma was drafted in the first round by the San Francisco Giants in 2003. In 2004 he lost the velocity on his fastball for unexplained reasons but has returned since being traded to the Cubs in 2005. He doesn't seem to have quite the package you would want out of a closer but he should be a competent set-up pitcher for a while. If you are the type to take chances on young pitchers (not something I suggest) Aardsma is a guy you might like; his upside is really high. Carlos Vasquez was suspended 15 games in April of 2005 for testing positive for steroids. Judging purely by his stats I would guess that Vasquez somehow managed to add some serious movement to his pitches, His walk rate ballooned to 5.68 from 2.62 in 2005 (3.53 in 2004) and his strikeout rate went from 8.13 (pretty good) to 10.66 (excellent). Overall, Vasquez looks like a decent prospect who needs to work on his control; probably not worth much fantasywise. There have already been rumors that the Cubs intend to move Cotts into their rotation. Cotts was a second round pick of the Oakland A's way back when. 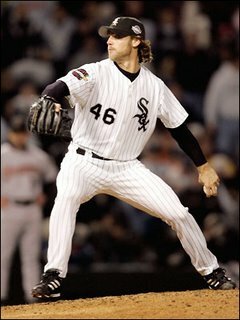 He was switched to relief when he was sent to the ChiSox in the Keith Foulke trade. Cotts had what looks like really bad luck to me in 2006. His H9 swelled to 10.67 from 5.67 in his extremely lucky 2005. Cotts looked pretty promising as a minor league starter and perhaps that's a better situation for him as besides his lucky looking 2005 he hasn't been great in relief. He also let his homerun rate blow up in his face from 0.15 in 2005 to 2.00 in 2006. The Detroit Tigers re-signed veteran first baseman Sean Casey to a one-year contract. Casey is not great as first basemen go especially as far as fantasy is concerned but for the Tigers he gives them the same much-needed on-base percentage that Gary Sheffield provides. He also provides leadership on the field which the young Tigers can use, something Sheffield is not capable of giving. The Texas Rangers signed catcher Miguel Ojeda. Ojeda is returning to Texas as a back-up to the Rangers' new starter Gerald Laird. Elsewhere on this blog you will find my raves about Laird from last season; I love him as a hitter, he reminds me of Mike Piazza in his prime. Sometime Sunday evening you can look for the offseason's first preparation article on relief pitchers.